Morton Grove, Ill. – May 28, 2013 – Goulds Water Technology, a brand of Xylem Inc., a leading global water technology company focused on addressing the world’s most challenging water issues, is expanding its mobile application offerings with the launch of a product and literature catalog application for iPhone®, iPad® and Android™. The mobile app enables industry professionals to gain one-touch access to brochures, submittals, performance curves, drawings, applications, part lists, and installation and operation manuals for the brand’s pumps and package systems for the residential and commercial buildings markets. Quick search functionality – Find products by product name, category, or type. Access literature by document ID, title, or product name. Automatic updates – Changes to product pages automatically update when the user opens the app and is connected to the Internet. Easy to navigate app design – Seamless support on the job driven by easy access to all product literature. Simple view and sort – Sort by product categories and types for on-the-go review. In-app view and email capabilities – Share documents from inside the Goulds Water Technology app, or select the preferred PDF reader. 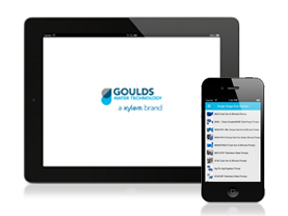 The Goulds Water Technology Catalog app is free and available for download from the iTunes StoreÒ or the Google Play StoreTM. This is one of several mobile applications released by Xylem, including the Bell & Gossett Mobile Catalog, and the Bell & Gossett ESP-System Syzer® – a proprietary HVAC tool that helps with piping system design – both of which launched last year. These Bell & Gossett brand apps, among others from Xylem, are available for Apple devices at the iTunes Store, and at Google Play for Android users. Xylem (NYSE: XYL) is a leading global water technology provider, enabling customers to transport, treat, test and efficiently use water in public utility, residential and commercial building services, industrial and agricultural settings. The company does business in more than 150 countries through a number of market-leading product brands, and its people bring broad applications expertise with a strong focus on finding local solutions to the world’s most challenging water and wastewater problems. Xylem is headquartered in White Plains, N.Y., with 2012 annual revenues of $3.8 billion and approximately 12,700 employees worldwide. In 2012, Xylem was named to the Dow Jones Sustainability World Index for advancing sustainable business practices and solutions worldwide. *Apple, iPhone, iPod touch, and iTunes are trademarks of Apple Inc., registered in the U.S. and other countries. App Store is a service mark of Apple Inc. Android and Google Play are trademarks of Google Inc.